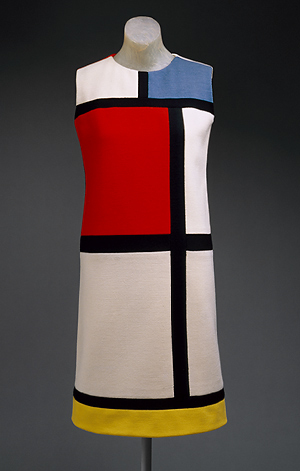 Yves St Laurent’s 1965 Mondrian dress collection features one of the most iconic dresses of all time. Quoted in several books and articles, and on display in museums from time to time, this dress has always been in my consciousness. Of course the dress itself was inspired by an original Mondrian painting that YSL had in his Paris drawing room. The stark black and white lines, with blocks of primary colours, may not have inspired everyone to design a dress, but like many designers inspired by art, YSL built the bold lines and colour blocks into a shift dress that was both shaped to the female form, and decidedly “rectangular” in its appearance. In order to make a copy I searched the internet for images of the dress, so I could determine its length, proportions etc. I also researched the construction. This was most interesting because YSL apparently built all the shaping into the seams, rather than relying on darts. I tried adapting my own basic shift block to achieve this but failed miserably. In the end I bought Vogue YSL pattern 1557. The original pattern had to be adapted in order to recreate the shaping and detailing required. I took alot of inspiration from Sarah Sheehan, a Canadian blogger who produces the most interesting research on vintage patterns. In fact Sarah made up V1557 as well as providing the definative analysis which is well worth reading. The existing pattern gave me the authentic YSL shift shape. I redrew the yoke, transfered the bust dart, and created the vertical and horizonal bars which are seamed into the dress. The original dress was made in wool jersey (although some versions were in silk) and it may be that the bust dart shaping was shrunk into the garment. I chose linen over using wool as the colours were truer, especially the white, although I used dark navy blue for the stripes as opposed to black. I lined it in white silk and inserted a hand sewn zip in the centre back. This had to be inserted very slightly off the centre back in order not to disrupt the vertical stripe. Have you ever copied a dress? Wow, that is amazing!! I’ve very impressed. Don’t think VW will tax you too greatly! I did wrap a piece of wooly check round my waist last night and figured a skirt would be easy (fixed with belt and kilt pin), but making a jacket would be a big challenge for me. Really looking forward to seeing how yours’ works out. hi Kate, I love your blog, is the dress you wear the YSL original design? I like the Vogue pattern 1557 a bit more because Its more minimalistic , simple . can I buy a copy of your pattern? I search the internet but i can,t find it. Thank you. I used the 1557 pattern and I adapted it quite alot to copy the original but it is not entirely accurate due to my use of the darts (which are there by implication in the Vogue version) . Why do you want the pattern Henk? I think this has to be my favourite blog dress on the Internet ever. It ticks all my boxes, you’ve made a great interpretation of a fab design and it suits you perfectly. Style, colour, fabric, length. All. Your. Ducks. In. A. Row. It’s seriously good and it’s fitting that you chose it for your header. Well done! Hello!! Wow, great dress. I consider this pattern to be the “holy grail” of dress patterns. Would you ever consider making a copy available or selling the pattern? This dress was the first work of art that I appreciated in my life. Thank you for the nice feedback Elma. It is not a difficult pattern to copy actually. 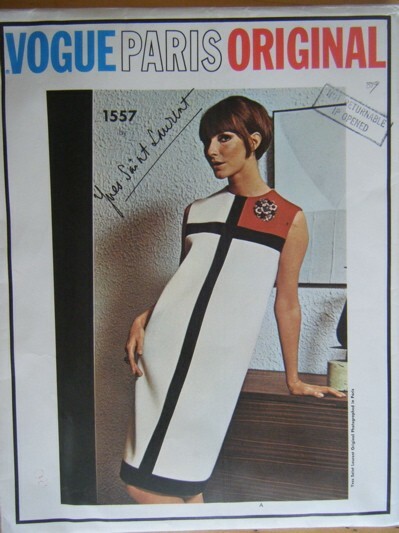 You need a good basic shift dress from the 1960s, and then just slice it up and colour block it. I may do a blog post on how I did it one day. Just an FYI. I have the Vogue YSL Paris Original 1557 in size 16. I’ve been holding onto it for quite a while as it is so special. I understand that since this pattern is extremely rare and in demand, I could get over $500 for it. I’m not sure I could even let it go at that! Who knows, I may be holding onto the last one!? Happy New Year folks! You don’t need the original pattern, there are plenty of hacks on line. I just found your blog and am starting at the beginning. This dress is terrific! I think the bust shaping is in the top black stripe, which looks to me to be lower on the model’s dress. In any case, yours turned out super well. I think that would be where YSL had his bust shaping. I did inspect the real thing in Amsterdam once. I may write it up! Thanks for reading my older posts! Wonderful. I prefer it in linen, you did an amazing job. I was never much of a Mondrian fan but for the dress.